Left to right, Federal Bureau of Investigation (FBI) Director Christopher Wray; Central Intelligence Agency (CIA) Director Mike Pompeo; Director of National Intelligence (DNI) Dan Coats; Defense Intelligence Agency Director Robert Ashley; National Security Agency (NSA) Director Michael Rogers; and National Geospatial Intelligence Agency Director Robert Cardillo testify before a Senate Intelligence Committee hearing on "Worldwide Threats" on Capitol Hill in Washington, Feb. 13, 2018. With U.S. congressional primary elections just weeks away, top intelligence officials are warning that Russia appears intent on trying to disrupt the 2018 vote much as it tried to do during the 2016 presidential election. 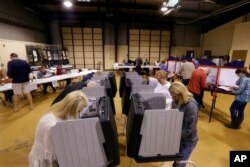 The heads of six major intelligence agencies told the Senate Intelligence Committee on Tuesday that Moscow sees the midterm elections as a potential target for "influence operations." ​The midterm elections are slated for Nov. 6. The earliest primary elections will be held March 6. ​Last month, CIA Director Mike Pompeo said he had "every expectation" that Russia will interfere with the midterm elections, a prediction he repeated Tuesday. FILE - Voters fill out their general election ballots at a polling place in Bradfordton, Illinois, Nov. 8, 2016. Russia's determination to interfere in U.S. democratic institutions is “not going to change or stop,” said one intelligence official. The officials said they agreed with a January 2017 assessment by the U.S. intelligence community that Russia tried to influence the 2016 U.S. presidential election. The assessment said Russian President Vladimir Putin personally ordered an "influence campaign" with the aim of boosting President Donald Trump's electoral prospects. While Trump has dismissed any suggestion that Russia sought to aid his campaign, the officials said they stood by the assessment. "I participated in the assessment. I stood by it then, and I stand by it now," Rogers said. Coats added that the intelligence community has seen no "evidence of a significant change [in the Russian threat posture] from last year." Concern about Russian meddling in elections runs across all 29 member NATO countries, he said. At a recent NATO meeting, Coats said, officials were asked for a show of hands or verbal response if they did not worry about Russian interference in their elections. "Everyone was silent," Coats said. "This is pervasive. The Russians have a strategy that goes well beyond what's happening here in the United States." Coats said Russia, China, Iran and North Korea "pose the greatest cyberthreats" to the United States. "Frankly, the United States is under attack, under attack by entities that are using cyber to penetrate virtually every major action that takes place in the United States," he said. "From U.S. businesses to the federal government to state and local governments, the United States is being threatened by cyberattacks every day." And yet the officials acknowledged that the U.S. has yet to formulate a national strategy to counter cyberattacks. Pompeo said U.S. intelligence has the capability to raise the cost for those who dare challenge the U.S. elections, but he added, "We do need a U.S. government strategy and clear authorities to go achieve that strategy." With the U.S. primary election season set to kick off next month, lawmakers expressed frustration that Congress has yet to pass legislation to safeguard the integrity of the U.S. election system. "Voting begins next month. It would seem to me that we'd need to be acting quickly," said Roy Blunt, a Republican member of the panel. Leaders of the intelligence panel said they'll recommend election security legislation when they release their initial findings into the 2016 Russian election interference in the coming weeks. "It is our hope and our belief that before the primaries begin, we intend to have an overview of our findings that will be public," said Senator Richard Burr, chairman of the panel. "It is the committee's intent to make recommendations that will enhance the likelihood that the security of our election process is in place." Senator Mark Warner, the ranking Democrat on the panel, said while many questions remain about Russia's actions in the 2016 vote, there is "a broad bipartisan consensus" on the intelligence panel that Moscow engaged in a coordinated attack to undermine U.S. democracy. "Make no mistake — this threat did not begin in 2016, and it certainly didn't end with the election," Warner said. "What we are seeing is a continuous assault by Russia to target and undermine our democratic institutions, and they are going to keep coming at us."